In the spring of 2014 as I slept, the light of the noonday sun filled my room and I awoke to the shining face of Ángel Coronai gesturing through the window. Following him to the backyard, I was led between the trees where he was laying new cable, and he revealed to me a stone box in the ground. 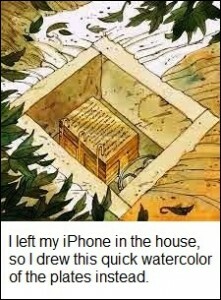 Inside were many strange objects including a book of ancient workmanship. Breaking the seal revealed a set of golden plates engraved with squiggly characters, which I believe are a kind of Reformed Gypsum. And as I pondered these things, my Corona passed over the characters, and they miraculously resolved into words. I quickly drank another and taped the bottles together. And by means of these goggles, the following story was revealed … the final chapter in the history of an ancient civilization. 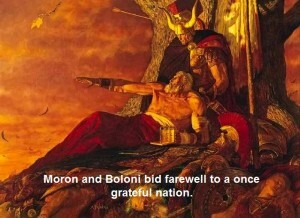 And it came to pass that I, Boloni, High Priest of the Neophites, was greatly aggrieved. For of the many plates of gold which my brother, the General Moron, gave to me as a record of my people, few now remain. For being desirous of adornment, the princess Leahona took of the plates of gold and fashioned a plain and precious necklace, and also a tiara, and matching bracelets and earrings, and a belly chain, and many other delightsome and ingenious ornaments that are beautiful to behold. And though I am sorely desirous of her beauty in her many adornments, and wish greatly to provide her with more, I have sent her into hiding with General Moron, and I must needs lay my stylus down and flee also for my life. For behold, the Neophites, my once grateful people, have brought war and rebellion to the palace gates. And they are wroth with me, for I have taken the tithes and offerings required for temple worship, and brought merchants to the creek and visitors to the square. And all this I have done to increase the strength of the church and my store of precious things. And the people say I have strayed from holy matters, and demand an accounting of the tithes I have collected, and the return of their gold and their bili-bíribongs and kilikili-kilí-kis and other precious things, and wages for their unpaid service, and restitution for their sufferings. And their anger has soured them as the Lemonites of old, and therefore I rename my people Lemonites. And though the true Lemonites of my generation are sweet and peaceful, yet they have refused me sanctuary. And therefore, I curse them all together with ignominy. And not one senine shall my people receive to reward their selfishness and pride, after such great gifts as I have already given them; to wit, the sweat of their brow and relief from the temptations of the fruits of their labor. And thus, war lies now heavy upon the land, and the city burns. And even mine own armies do rebel against me, excepting only the Sons of Shelaman, who remain at my side. And behold, the palace door is broken, and I lay my stylus down and depart to preserve my life and secure my treasures in the earth, even the remaining leaves of gold and the princess’s shapely breastplate and her jeweled eyepiece. And there they shall remain, until this war is done, and I return to my sweet princess Leahona, and lay these lovely adornments upon her. And I earnestly pray that this may soon come to pass. And thus I, Boloni, seal this record as a testimony against my lost and fallen people, there to remain until I return, or a peepstone discover it, or the world end. Amen.